Lancaster Station Detectives looking to identify two suspects, wanted for stealing credit cards. 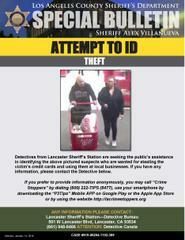 Lancaster Sheriff's Station Detectives need your help identifying the male and female shown in the picture. The suspects are wanted for stealing credit cards and using them at numerous businesses. If you can identify these individuals, please contact Detective Canela at (661) 948-8466.